Somerset County is a county located in the North Central New Jersey. As of the 2017 Census estimate, the county’s population was 335,432, making it the 13th-most populous of the state. Somerset County is part of the New York Metropolitan Area. In 2015, the county had a per capita personal income of $86,468, the second-highest in New Jersey and ranked 25th of 3,113 counties in the United States. In 2012, 49.8 percent of Somerset County residents were college graduates, the highest percentage in the state. Somerset County was recently ranked number 3 of 21 NJ counties as one of the healthiest counties in New Jersey, according to an annual report by County Health Rankings and Roadmaps. Somerset County parks include Lord Stirling Park (part of the Great Swamp National Wildlife Refuge), Colonial Park (with a lovely rose garden), Washington Valley Park (with biking and hiking trails), the Sourland Mountain Preserve (hiking and mountain biking trails), and the newest park in development called Raritan River Greenway (which is being developed along the Raritan River in Bridgewater Township). The southeastern portion of Somerset County in Franklin Township also includes the Delaware and Raritan Canal State Park, which provides hiking, biking and boating. Trump National Golf Club in Bedminster is an exclusive golf club. Somerset County is home to two colleges: Raritan Valley Community College, North Branch section of Branchburg Township (public). Rutgers University has a partnership with Raritan Valley Community College which allows students who have an accredited associate degree to complete a bachelor’s degree by attending Rutgers classes at RVCC’s North Branch campus. Somerset Christian College, now known as Pillar College, is located in the Zarephath section of Franklin Township (private). 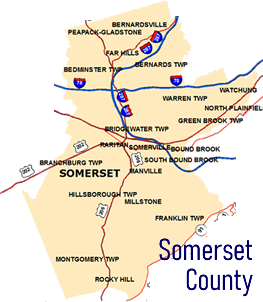 Somerset County is served by a number of different routes. Major county roads that pass through include County Route 512, County Route 514, County Route 518, County Route 523, County Route 525, County Route 527, County Route 529, County Route 531 and County Route 533. The only two state routes that traverse through are Route 27 (only in Franklin) and Route 28. U.S. Routes include U.S. Route 22, U.S. Route 202 and U.S. Route 206. The two interstates that pass through are Interstate 78 and Interstate 287. Interstate 95 was planned to run along the Somerset Freeway from its proposed southern end in Hopewell Township, Mercer County to Franklin Township at I-287 in the 1960s. However, this plan was cancelled in 1983. Route 18 runs at the New Brunswick border of Somerset. NJ Transit provides train service on the Gladstone Branch and the Raritan Valley Line. Public bus transportation is provided by several transit agencies. NJ Transit provides bus service to the Port Authority Bus Terminal in Midtown Manhattan, as well as service to major cities in New Jersey and within Somerset County. Housing options in Somerset County range from Single Family Homes, Luxury Homes and Estates, Condos and Townhouses in towns, to apartment and condo and townhome rentals. 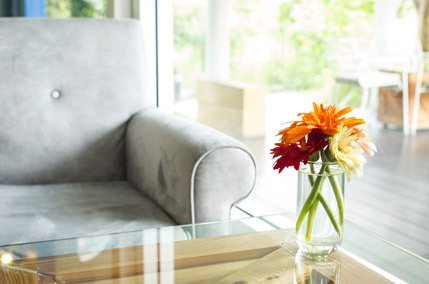 You have choices from intimate, seven-unit renovated Victorian buildings to Multi-unit development with amenities such as a club house, swimming pool and tennis courts or perhaps something in between. Our team cover parts of Somerset County Real Estate, including towns like Basking Ridge and Bernards Twp.